Brake fluid is a central part of your brake system. It lubricates the internal mechanisms of the system and transfers the force your foot exerts on the pedal into the clamping force that stops your vehicle. For this reason, standards are put in place to ensure that the fluid meets key criteria and allows your brake system to work as designed. Let’s take a step back and go over how a brake system works before we get started with the Key Characteristics. Consider the [very] simple work of art below. The schematic shows how the brake fluid (light orange) is the medium in which force is transferred without a brake booster. The force of the pedal gets converted to pressure through the master cylinder. That pressure is transferred from the master cylinder to each caliper, through the brake fluid. The pistons in the calipers then convert that pressure to a force that clamps down on the rotors. Drum brakes work in much the same way. For the system to work efficiently, the brake fluid must be able to move easily through the lines (kinematic viscosity) and must be able to efficiently transfer the pressure from the master cylinder to the piston. The efficient transfer of pressure relies on the incompressibility of the brake fluid. When we talk about brake fluid, incompressibility is related to the boiling point of the fluid. We’ll get into how later on in this article. Viscosity of a fluid, in simple terms, is how thick the fluid is. Kinematic Viscosity is a measure of how much the fluid resists flowing under the force of gravity. It’s measured in squared-millimeters per second (mm2/s), also known as the unit Centistokes abbreviated as cSt. In less-complicated wording: Imagine taking a jar of honey and pouring out all the honey. Kinematic viscosity is a measure of how slowly the honey pours out. The more time it takes, the higher the kinematic viscosity. So, a fluid with a high kinematic viscosity tends to run slowly (as with the honey) and a fluid with low kinematic viscosity tends to run fast (think of water). To put some numbers to it, consider that the viscosity of water at room temperature is around 1.0 mm2/s and the kinematic viscosity of honey is around 6,900 mm2/s. For most fluids, viscosity tends to change depending on temperature. Fluids such as honey, for example, increase in viscosity as temperatures fall and decrease in viscosity as temperatures rise. The same can be said for brake fluid. Kinematic viscosity is a key characteristic of brake fluid since the system must operate smoothly within a wide range of temperatures. Technologies such as ABS, Stability Control (ESP), and Traction Control, require fast-moving fluid (low viscosity) in order to operate correctly. These systems use fast activating valves to control the flow and pressure of the brake fluid at critical times of operation. If the viscosity of the brake fluid is high, then the movement of the fluid through the lines will be sluggish and difficult to control. The last thing you’d want is a brake system that doesn’t want to work on a cold winter day! The boiling point of brake fluid is another key characteristic and a fairly important one since at this point, the liquid turns into a gas. Gasses are compressible and will severely reduce the effectiveness of your brake system. Compressibility of a fluid means how much a set mass of the fluid can change in volume when a pressure is applied. Compressible fluids will result in a very inefficient brake system: your pedal will need to travel further, the reaction time of the system is much slower, and the resulting clamping force to the brakes are significantly reduced. All brake fluids are designed to be as incompressible as possible in their liquid state. However, if enough heat builds up in the caliper from excessive brake use, the fluid will boil and gasses will be produced. These gasses displace brake fluid in the lines and introduce compressibility, making for a very mushy and ineffective brake system. This boiling point is called the Equilibrium Reflux Boiling Point (ERBP). The ERBP is the temperature at which the uncontaminated (moisture-free or “dry”) brake fluid begins to boil… Which brings us to another point. Another factor that affects the boiling point of the fluid is water. Most brake fluids are glycol ether- and borate ester- based brake fluids which absorb moisture (i.e. they are ‘hygroscopic’). Because of this property, the moisture from the environment gets absorbed into the fluid and the boiling temperature is reduced (water has a lower boiling point). This “wet” boiling point when moisture is mixed into the brake fluid is called the Wet Equilibrium Reflux Boiling Point (Wet ERBP). The Wet ERBP is the temperature at which the fluid begins to boil after it has had time to absorb moisture from the surroundings. This temperature is a good indication of the limits of use of a moisture-contaminated fluid. Figure 4: ERBP vs Wet ERBP. 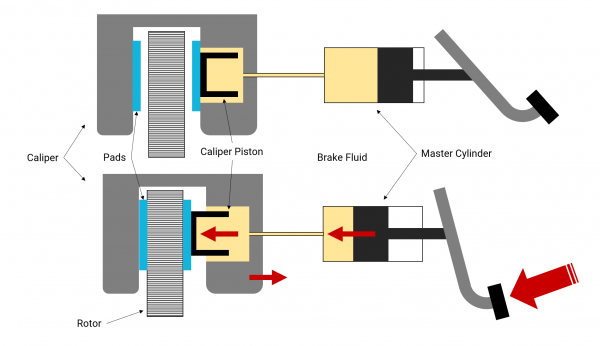 Kinematic viscosity, ERBP and Wet-ERBP are key characteristics that define brake fluids. It is important to have a brake fluid that moves freely through the system at a wide range of temperatures so that you can take advantage of the proper use of technologies such as ABS. That’s where Kinematic Viscosity comes in. You’ll see in the next part of this series of articles that the Kinematic Viscosity in a fluid is measured at a minimum temperature of -40 C and a maximum temperature at 100 C. This is done to give a fairly good indication of how well the fluid performs at a wide range of temperatures. Knowing the dry (ERBP) and wet (Wet-ERBP) boiling points of the fluid will give you a good indication of how much aggressive driving and contamination the fluid can take before your system becomes compromised. Kinematic Viscosity is a measure of how much the fluid resists flowing under the force of gravity. 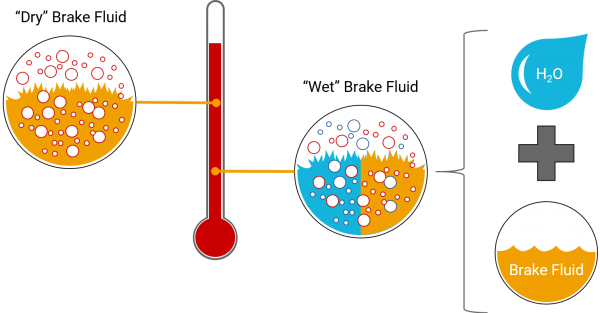 Equilibrium Reflux Boiling Point (ERBP): The ERBP is the temperature at which the uncontaminated fluid begins to boil. In this case, uncontaminated means free from moisture that may have been absorbed from the surrounding environment. Wet Equilibrium Reflux Boiling Point (Wet ERBP): The Wet ERBP is the temperature at which the fluid begins to boil after it has had time to absorb moisture from the surroundings. This temperature is a good indication of the limits of use of a moisture-contaminated fluid.